Another day of lovely woodland (just a bit at the start) and lots of sweeping balcony paths, culminating with Monte Prado, at 2054 metres the highest point on the GEA route. The trees were negotiated as we thought of Wythenshawe's parkrunners about to head off on their weekly trial through the muddy passage in Manchester drizzle. For us, the sun was shining again as the previous two days' weather pattern was repeated. Sue lagged on occasion today. I hope she came away with some prize winning images of fungi, field gentians and other tasty subjects. On the ridge, a herd of goats was approached, but not too closely as a Patou sheepdog was definitely in charge. Lunch was taken before the final pull to Monte Prado. English voices were heard. It turned out to be half a dozen folk who live in Vellano, a couple of hours' drive away. We spent a while with them at the top of the hill, from where today's top picture was taken. It looks down to our destination today, a friendly rifugio that is in a small clearing in the centre of the picture. The other pictures were taken later at the Rifugio, which has wifi. There were good views in all directions, and not a windfarm in sight. Darren Hackett, Casa Verde at Vellano (info@tuscanyholidays-casaverde.com). After saying goodbye to Darren and his mates and wishing them well with their Via Francigena project, we descended through bilberries and raspberries, of which there is a glut on the GEA, to reach Rifugio Bargetana soon after 3 pm. It was busy with walkers and mountain bikers and even has a music event tonight. We are in a dormitory with six bikers. It's situated in a lovely woodland glade. Some visitors are camping outside. 9 pm. We've eaten lots of polenta and sausage and cake and potato slices that some choose for dessert. The wine has flowed. In contrast to previous nights we are in this rifugio with over thirty guests and a gig is in full flow. The cyclists and walkers could be excused for being a little bemused? Note - we are here because the planned end of today's walk, Albergo Carpe Diem at Passo di Pradarena, is closed. Tomorrow will be a longer day. NB Distance and ascent are as per ViewRanger (ascent figures may be generous if it's anything like Anquet) and times include breaks. Thanks for your comments. I'm not replying individually because I've a limited data allowance and Android also annoyingly sends two copies of every comment. Conrad spotted a 'lurker', probably somebody doing something no more suspicious than stripping a bush of raspberries. It was another 'blue sky' start, with bits of cloud developing during the day, but no threat of rain. (Ie same as yesterday). Except that after we arrived around 3.30 pm there were several claps of thunder and bright flashes, reminding us that storms can develop very quickly in the mountains. Rifugio Giovo was fine, but our most expensive accommodation yet at €64 each for half board, a round of beers, a litre of wine, a pot of tea and some bread and cheese and salami for today's lunch. After watching a heron float lazily over the lake where lots of fish were jumping last night, we got away soon after 9 am and spent the first few hours leapfrogging the Belgians before eventually leaving them to enjoy an early lunch. Today's easy paths were an absolute delight. 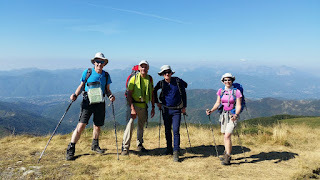 We started with a gentle ascent through woodland then over open ground with fine views to the Alpi Apuane - clearer this morning - to reach Colle Bruciata and a pow wow with Yves and Michel (now correctly spelt). There was a familiar whiff in the air here, and we soon spotted a large herd of goats on a nearby hillside. We also saw sheep today, hemmed into a small pen in the forest. Graham startled a snake that slithered quickly into the undergrowth, and I startled a rabbit that hopped nonchalantly away. 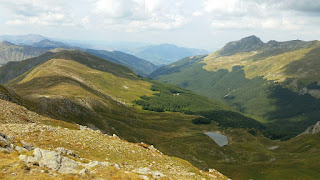 From Colle Bruciata, Graham went over a minor summit, Cima dell'Omo, whilst the rest of us took a superb balcony path. At a panoramic corner Yves took the phone and Michel substituted for Graham in today's picture. The route continued in the same vein for the rest of the day, switchbacking beneath a soaring eagle along the roller-coaster crest of the Apennines, dipping occasionally in and out of woodland. T-shirts and shorts were again the preferred attire. The sun tan cream is taking a bashing and Sue and I haven't needed our waterproofs at all. We left the Belgians to descend to San Pellegrino, and continued on to reach 'Old style Hotel Lunardi' at Passo delle Radici soon after 3.30 pm. The rooms are comfortable, with added en-suite facilities in the corner that could be described as bijou. There's no wifi (again - there was none last night) and a stalwart band of elderly staff are striving to provide a meal for us at 7.30. We met just a handful of people today, and we may be the only guests at this 29 room hotel. Later: I think we are the only guests though there was one other diner. Tonight's four course meal was the best yet - thick soup, tagliatelle with mushrooms, sausage and veal with chips, fried polenta and mixed salad, followed by bilberry cake. All very tasty, but we are stuffed. A 'blue sky' start, with bits of cloud developing during the day, but no threat of rain. Pleasantly cool in t-shirts and shorts on the tops. The path rose gently past lots more willow-leaved gentians, through beautiful woodland, eventually steepening to emerge from the forest near Lago Nero, a lovely spot where we are pictured taking one of today's many breaks. 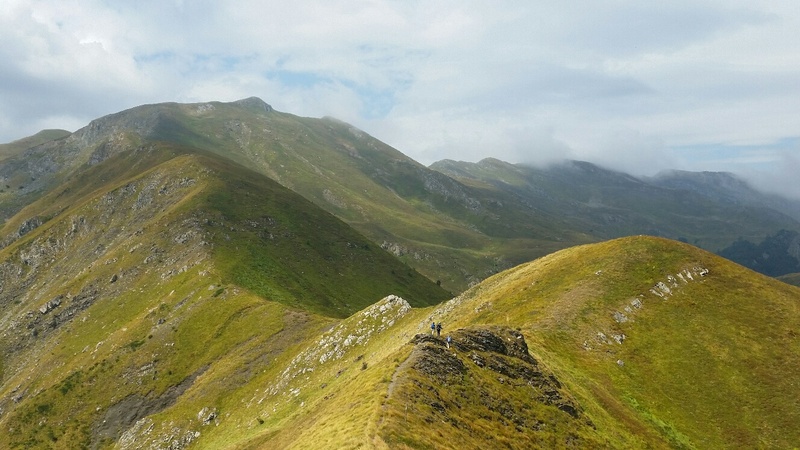 From then on, until the last bit of descent to Lago Santo, we were high on the crest of the Apennine chain. A heat haze corrupted distant views, for example to the marbled summits of the Alpi Apuane, but we could look back to the ground we'd covered since leaving Pracchia with satisfying clarity. From Lago Nero the path crested the ridge, passing over several summits that the lazy Belgians, who we encountered from time to time all day, missed out. They did however follow us up the steep exposed scramble to our final summit, Monte Rondinaio. This 1964 metre chunk of mountain is apparently the second highest point we will reach on this trek. There was a soggy visitor's book that we ignored. Yves and Michele arrived soon after us. The six of us were the only GEA walkers out today, but there were lots of day walkers in this scenic area. Rondinaio means 'swallow'; today it was martins that were scooping up the insects. 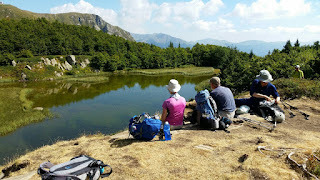 An easy descent by one of a choice of paths led us down to the fleshpots of Lago Santo Modenese. There are three rifugios here. Vittoria was open and looked idyllic in the afternoon sunshine. Marchetti was closed. Giovo had been hard to book and Sue's phone call had effectively secured a room for three men. After initial confusion we were soon sorted out with a double for me and Sue, and a family room for Cary and Graham. We left them to fight over the double bed and headed down for a pot of tea. Rifugio Giovo has fed us on tagliatelle with ragout, trout with chips and salad, and mille-feuille with bilberries. Excellent. And red wine. Served by Eleanor, a recent psychology graduate with very good English (hello Eleanor - feel free to contact us, and to visit us in Manchester), who looks like parkrunner Jenn's long lost sister. The lazy shy reticent Belgians, Yves and Michele, are also here and have assisted with the above 'report'. Very jolly! Yves stresses that they are not lazy at all - they followed the route description in Gillian's first edition whereas we are using her second edition! Started in a cloud, which slowly cleared to yield blue sky. Gradually clouded over again, with distant thunder and light rain shortly after we finished. 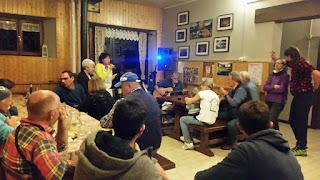 We were the only guests at the Rifugio last night. At some point Cary and Graham admitted that their late arrival was partly due to them walking past the Rifugio in the fog and ending up at the old Refuge at the other end of the lake. It was securely locked. That's the one marked on the Kompass map, so they had no idea where we were and there was no phone signal. Eventually they found us, but anyone visiting Scaffaiolo should bear in mind that the Rifugio is at the north east end of the lake. We set off at 9 am (8 am for those with Fitbit watches), and after passing the old refuge we followed a path that was signposted to Passo Calanca but took us over the wrong ridge. That was swiftly corrected, thanks to ViewRanger. It was a fine roller-coaster ridge walk for much of today. Soon after passing a cloud riven WW2 memorial and relics, the vapour began to dissipate. We enjoyed elevenses at Colle dell'Acqua Maria, where marmots whistled and a group of about eight Italian day walkers passed in the other direction. They were the only people we saw all day. There were a few exposed sections as we passed over Cima Tauffi and along the ridge to Libra Aperto, at 1936 metres our high point of the day. Today's picture was taken in the vicinity of Cima Tauffi, looking ahead to Libra Aperto in the distance. 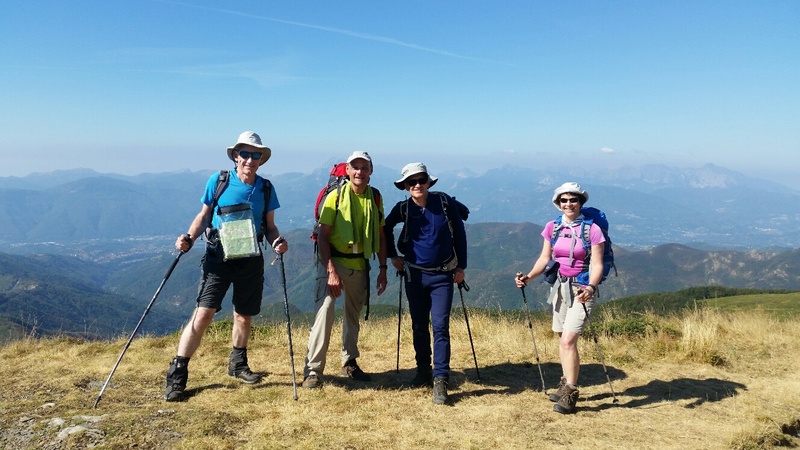 Our views also extended back along the ridge and on to mountains peripheral to our route, as well as to several valleys sprinkled with the white houses of small communities in the approximate area in which Eric Newby's classic book 'Love and War in the Apennines' is set. 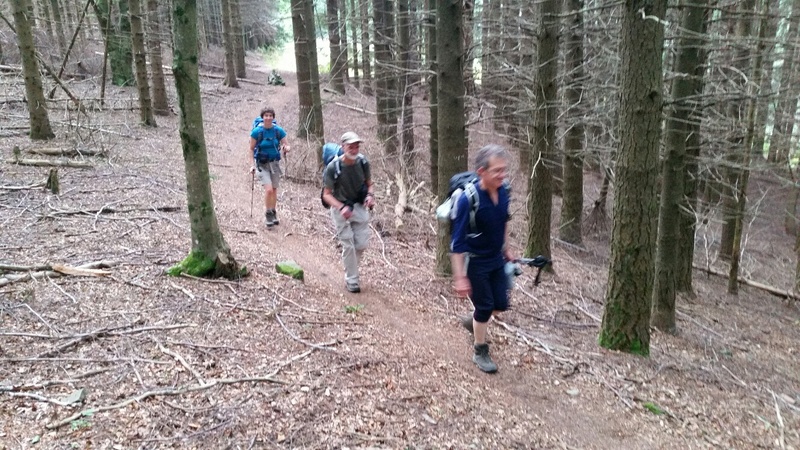 A pleasant descent into woodland with huge ants' nests concluded the day's walk. By 4 pm we were enjoying a pot of tea outside Hotel Primula, where half board is a very reasonable €40 per person. Many small kestrel like hawks have been seen, as well as grouse, meadow pipits, jays, wheatears and others. They are mostly very quiet - the singing season is long gone. Flower of the day: Willow-leaved gentian. A list of the flowers we've identified will appear in due course. The most ubiquitous today were carline thistles and ling (heather). Hotel Primula is great. They have fed us well and even provided extra cake - the same dessert as last night, but this one was freshly baked and absolutely delicious. It's a sort of lemon sponge with lemon flavoured crême patisserie inside. The two friendly Belgians, Yves and Michele, are also here. They are using Gillian's first edition guidebook, so they were pleased to compare notes, as we are using the new edition. They could actually purchase a copy here. Clarissa is proud to have them on sale. The family here have English connections and speak good English as well as being friendly and accommodating (like virtually everyone we encounter over here). A cloudy day with sunny periods in between threats of rain. After an adequate breakfast at friendly Hotel Melini, we sorted out lunch at a nearby shoplet and Cary got some cash and posted a few unwanted items home. He, Sue and I have very little luggage - small 5 to 6 kilo day sacks, whereas Graham's bag feels nearly twice as heavy. No doubt he will appear in a different outfit every night, a picture of sartorial elegance. We set off on Stage 14 of the GEA around 9 am, though Sue and I have Fitbit watches that steadfastly refuse to accept European time so we were stuck in a GB time warp at 8 am. They also refuse to 'sync', leaving me feeling I'd be better off with my trusty Altimax. 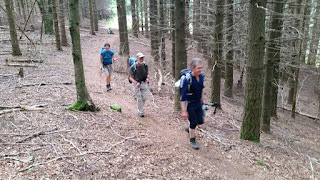 Starting steeply and sweatily up a path through trees to reach a wooded ridge, we continued upwards to emerge from firs into lovely beech woods (pictured) that led eventually to a picnic bench in a clearing. The pause was welcome, especially as Sue produced some shortbread. The next picnic bench was occupied by the first people we saw today. Two Belgians who were also starting the GEA route from Pracchia today. They made room for us on the bench and explained that they had chosen a shorter day than us and were heading for Rifugio Porta Franca. We may see them again. Despite still being August it seems to be out of season here. 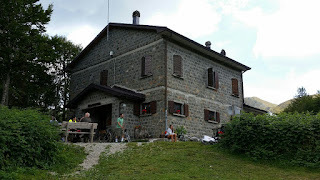 We enjoyed a lavish lunch a bit further on, on the picnic benched terrace outside Rifugio al Montanaro. There was no water available and I'm not sure whether the emergency room was open. By now the air was heavy, the rumble of distant thunder was getting closer, and rain looked inevitable. Soon after a four way junction* where the sparkling new signs were pointing in the wrong direction, a painted waymark a few metres away gave the game away and we followed route 20 to a spring that was just a slow dribble. Cary and Graham took advantage of this. Sue and I ambled on along the excellent contouring path that arrives eventually at Passo del Cancellino. It was cool here. There was no sign of the others so in view of the ominous weather we pressed on up a 200 metre ascent to another col. Drops of rain. Still no sign of the others. So we made a quick dash over a rocky crest then enjoyed a roller coaster belvedere route to pop out unexpectedly at the Rifugio next to Lago Scaffaiolo. Meanwhile, C and G had decided to go over the summit of Mount Gennaio and by the time they reached Passo dello Strofinatoio the threatening weather forced them onto a roundabout route. Hence their late and rather wet arrival, by which time Sue and I had got through a huge pot of tea and were becoming a little concerned! We are the only people staying here tonight. Dinner was vegetable soup, polenta with sausage meat, lots of red wine, and cake. Views from the rifugio were intermittent, with rain continuing into the night. * Passo del Malandrini - meaning 'pass of evildoers' (such as those who incorrectly position signs). 5.45am - taxi to airport. Oops, I picked up the flight time as the gate closing time. Could have had another half hour in bed! Through security by 6.20. No banana guard to hold us up today. Breakfast in the usual place - Starbucks by the prize car in Terminal 1. Graham turns up - the hold bag containing our walking poles has been safely deposited. LS883 - Jet2 to Pisa - 8.35 (departed on time). Land early. 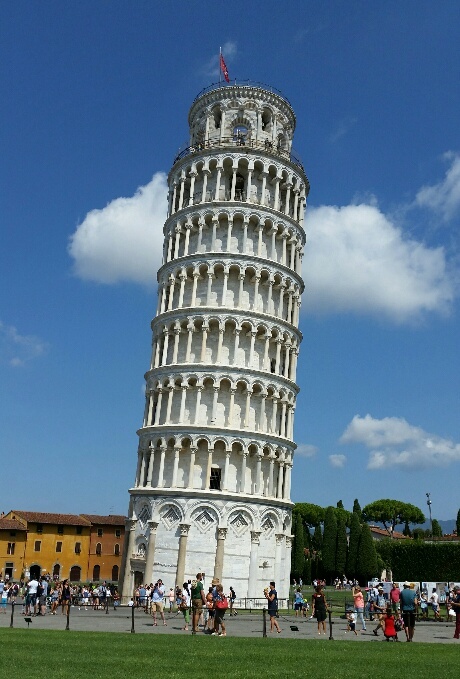 Easily through customs and onto the shuttle bus to Pisa. A very short journey. Al fresco lunch in a square dominated by a statue of Vittorio Emanuel II. A nice salad. 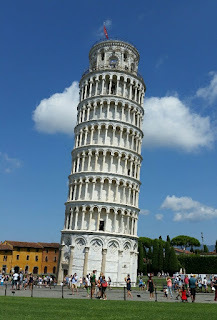 Wander over to ancient artefact of Pisa (pictured) and associated buildings. Hot. Lots of people. To be expected at this iconic site. I first visited it on my first trip abroad, circa 1972, when we travelled in John Clark's Ford Cortina for a holiday in Forte dei Marmi. I still need to develop the photos from that trip! Could be fun! Easy journey to Pracchia - 2 hours or so; two trains and a bus. Cary had been there for two hours. We were expecting a room for four at Hotel Melini. We got a twin and a double. That's fine. As was the meal. It has been a long day. No wifi up in the room, so after a long sleep this should transmit tomorrow. In April 2013 Sue and I enjoyed the southern twelve sections of the GEA. Reference to the sections is by way of Gillian Price’s Cicerone Guide. An advance party is already out there (hopefully he will complete section 13 tomorrow! ), and luckily we shouldn’t be affected by the recent earthquake. Cary seems safe and sound in a bothy tonight and should join us in a hotel tomorrow. We’ll also be joined by Graham B on this trip. The picture is a more gloomy April view in the Apennines, selected at random from my 2013 snapshots. Our 2013 trip is recorded here. I believe it’s a bit warmer there just now.